Dr. Damon Tweedy is author of the New York Times bestseller Black Man in a White Coat, selected by TIME magazine as one of the Top 10 Non-Fiction books of 2015. He has published articles about race and medicine in the Journal of the American Medical Association (JAMA) and other medical journals. His columns and op-eds have appeared in the New York Times, Washington Post, and various other print publications. Dr. Damon Tweedy travels frequently to speak to physicians and clinicians, healthcare companies, medical schools and teaching hospitals, and other organizations involved in health and wellness, about the impact of race on the medical profession at all levels. Dr. Tweedy is a graduate of Duke University School of Medicine and Yale Law School. He completed both his medical internship and psychiatry residency at Duke Hospital. He is currently an associate professor of psychiatry at Duke University School of Medicine and a staff psychiatrist at the Durham Veteran Affairs Health Care System. You can visit his website and Facebook page for additional information. Is There a Black Doctor in the House? Dr. Tweedy takes an engaging look at the small percentage of black physicians in the U.S. and examines the implications for both doctors and patients. Doing the Right Thing Dr. Tweedy weaves together research findings, clinical experience, and personal narrative into a provocative survey of the leading causes of death and disability among black people. Read an interview with Damon Tweedy with Stat News. 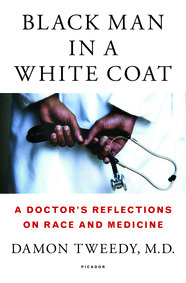 Watch Damon Tweedy discuss his book, Black Man in a White Coat, on CBS. Check out Duke Chronicle’s profile on Damon Tweedy. Learn more about Dr. Tweedy on his website and follow him on Twitter. "Dr Damon Tweedy delivered a lecture and gave interviews that were very well received by listeners. Dr Tweedy was the epitome of gracious and professional, despite a long day of travel and audience interactions. He had prepared slides that presented scientific data of relevance to his topic, and blended a traditional academic lecture with case material arising from his own experiences and practice--most also documented in his book. All in all, this was a most positive and memorable experience for our students and constituents." "Dr. Tweedy left many of the Atlanta Metropolitan State College (AMSC) students, faculty and staff motivated to walk into their journeys with eyes open. His words were uplifting, inspiring and insightful. The delivery and style of his life experiences were brilliant and well received. Substantive information with relevance!" "It was a delight and an honor to have Dr. Damon Tweedy come speak to us at Seattle Children’s Hospital. A warm, intelligent presence, Dr. Tweedy took the time to ask us how he could best serve our staff and residents and knocked our Black History Month event out of the park! It’s obvious he really wants to engage with his audience and tailored his presentation, sharing great anecdotes and answering questions. During a short roundtable discussion about inequities in healthcare, he was interested in our work and we all walked away from the afternoon reflecting on the role we all have in reducing them. I highly recommend reading his book and seizing the chance to talk with him about it!" "In his notably gracious and humble style, Damon Tweedy thoughtfully invites his audiences to consider the broader implications of his personal experiences with race and medicine. It was truly a pleasure to have Dr. Tweedy as the keynote speaker for our MLK celebration. Our medical students were especially thrilled to meet him!" "An audience of nearly 200 faculty, students, and members of the community were captivated by Dr. Damon Tweedy’s reflections on his life and career in the medical profession. They were especially intrigued by his discussions as to how race, class, and gender issues significantly impacted medical care and practice. Dr. Tweedy’s lived experiences brought the subject matter to life and made it real for the audience, especially the students who were considering careers in the health professions." "Dr. Tweedy was a hit. We had a long line for his book signing. I know he was supposed to sign books for one hour but he stayed until all the books were signed. The students were doubled excited to learn he had been a member of SNMA when he was a med student at Duke." "He was well received on campus, especially with staff and faculty form the College of Medicine. He was very humble and easy to work with." "It was a pleasure to hear Dr. Tweedy speak at the National AHEC Organization’s 2016 national conference. As Dr. Tweedy shared his personal experiences of being one of very few African-Americans in his medical school class at Duke University in the 1990s, he touched on many broad social issues facing health care currently and problems that AHECs everywhere are working on: the stagnant growth in the diversity of health professionals; the disparity in health care outcomes and access to care for minority populations; an educational system that fails to create opportunities for all students regardless of race or socioeconomic status. I found Dr. Tweedy’s talk to be rather moving and a call to action, despite being stated with a gentle manner, and I know that the nearly 500 conference attendees found his keynote address to be one of the highlights of the weeklong conference." "Fantastic! Dr. Tweedy was engaging, took into consideration his target market, and was well organized. Loved his closing remarks and his advice to our medical students. He was approachable and easy to work with. Our students, faculty and staff enjoyed the his lecture, question and answer, and book signing."